Japanese etiquette is brought to the Back Bay with Douzo. 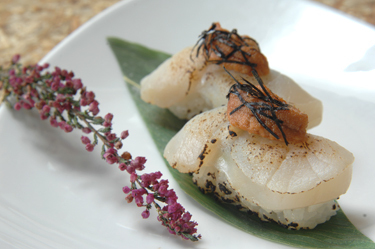 Meaning "go ahead" in Japanese, Douzo features an immaculately decorated, split-level sushi bar, lounge and dining room large enough to accommodate the needs of Boston fish-lovers who've been craving spectacular sushi right in their own neighborhood. The renovated, origami-themed interior features high ceilings, mahogany woodwork, breezy fabrics and a few novelties, including triangular tables. Right next to Back Bay Station on Dartmouth Street, Douzo also offers a 300 square foot takeout area and validated garage parking.